When I first heard about this new series by Holly Black and Cassandra Clare, I was both really intrigued and excited. I was really curious to see what a combination of ideas from these two impressive authors would be like and also how different it would be to their previous stories and to the other well-known middle grade fantasy series it has been compared to (Harry Potter). Despite my excitement and as with any book I have high expectations for, I was also a little bit nervous to start this book. And while I did find the beginning to be a little bit slow-going as the characters and this new world is being introduced, I also quickly came to enjoy it. I very much enjoyed the friendship between the three central characters, I loved the introduction of some magical creatures and also discovering some twists and surprises at the end. The main character of this story is Callum Hunt who has just celebrated his 12th birthday. 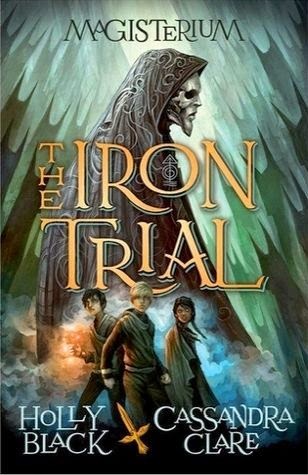 Because his is a magical family, he has been invited to take a test at the Magisterium that will determine if he has the magical ability to attend their magic school and apprentice with a powerful mage at the school. But Callum is not like other prospective students with the school. He has been raised by his single father who hates magic and is determined for Callum to fail his magic tests and to avoid magic at all costs. But that is not to be for Callum Hunt who has been picked as one of three apprentices by the most powerful mage at the Magisterium. Together with new friends, Aaron and Tamara, they explore the school, manage deathly-dull tasks set by their mage and get into a fair bit of trouble. I love that Call is so reluctant at first to join in and has such misgivings about everyone around him but slowly he grows to love magic and makes some solid connections with the other students. I think that a lot of people have already spotted that there are similarities here to the Harry Potter series: a trio of magical students who enter magic school who are training towards defeating an evil wizard. There's even a 'chosen one' and a Malfoy-esque arch-nemesis. But if you get past all of that, and not let that distract you, this story is one that is worth reading. It is fun and exciting and has a diverse set of characters and some twists that you probably won't see coming. I do recommend it! I'm not really surprised by the Harry Potter similarities, but glad to hear this is an enjoyable read overall. I do really like the idea that Callum doesn't want to be involved with magic at first. Thanks for the review, looking forward to read this one!